Evidence of aliens in 19th Century Earth are accompanied by another strange artifact: Data's 500 year-old severed head. Data's certainty that he will die in the late 19th Century seems a bit unwarranted, given the various instances of time travel on the show thus far. If it had been established that time is immutable and utterly constant, his assertion that "it has occurred, it will occur" and that "you cannot cheat fate" would make sense. However, we've seen drastic changes to history already--"Time Squared," "Yesterday's Enterprise," and "Captain's Holiday," for example, not to mention all the times it happens in TOS--so it should be clear to somebody as intelligent as Data that evidence of something happening in the past as a result of time travel is not positive proof that it must happen again in the future. The "synchronic distortion" concept makes no sense. If people are living a fraction of a second in the future, and you are occupying the same space as them, then you will bump into them in a fraction of a second, especially if you are going by the "time is immutable" theory of time travel. The only way to square the concept of "synchronic distortion" with reality would be to assume a second temporal dimension, which automatically throws any sense of linear time right out the window, thus unraveling the entire fabric of this story. When Data is adjusting his "synchronic distortion," he phases out of reality in much the same way as the Traveler (and Wesley) in "Remember Me." I like the scene where Data is describing what he's seeing but all we are shown are the faces of the crew listening in. It makes the whole thing more mysterious and creepy. "Ophidian: (n) A member of the suborder Ophidia or Serpentes; a snake." The running gag in this episode about Data being French never gets old to me. Why is Data's first priority upon finding himself in the past to acquire lodging? As an android, he doesn't need a place to rest. It's important, no doubt, but it doesn't seem like it should be the first thing on his mind. Perhaps there's a Starfleet protocol for such situations, and Data is just following it. The old guy shaking in the alley, mumbling "help out a 49er, fell in a shaft, help me," right before he gets "taken" by the aliens is pretty disturbing. Gives me the jibblies. "If our remains are in that cavern, they would have turned to dust long ago." Such a great, ominous line, perfectly delivered by Worf. So, wait, Data can't use contractions, but he can say "gonna"? What is Guinan doing on 19th Century Earth, and who's her father? I'm going to save much of what I have to say about this episode for the next half. Data talking about his own death is a little more relevant given what happens at the end of Star Trek: Nemesis. Though Data is clearly operating under the assumption that you cannot change history, his behavior upon finding himself in the past is a violation of the Temporal Prime Directive. Lucky for him that it hasn't been decreed yet. Frederick La Rouque is Marc Alaimo's fourth and final appearance on TNG, before being cast as Dukat in DS9. Worf mentions the idea of "a guerrila war" involving aliens covertly going back in time to change history. This is pretty forward-thinking, as it is a good description of the "Temporal Cold War" story arc throughout ENT. Best episodes: "Unification," "The First Duty," "The Inner Light." Worst episodes: "Ethics," "Cost of Living," "Imaginary Friend." 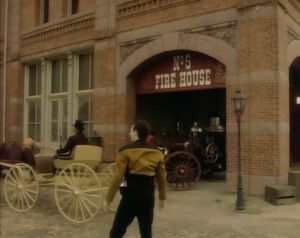 Though a little more uneven than the last two seasons, the fifth season of TNG contains some of the show's best episodes. In addition to the three mentioned above, there are other great episodes like "Darmok," "Disaster," "Cause and Effect," and "The Perfect Mate." Most of the episodes that instantly come to my mind when I think about TNG are from this season, even as "Ethics" and "Imaginary Friend" were among the ones I dreaded rewatching the most. Like the fourth season, TNG has fully embraced its characters and style, but the writers continue to push things forward and experiment. The addition of Ro is good, even though her character feels largely neglected most of the time. Many characters get an episode or two to shine, but the one who shines brightest is easily Picard, with many episodes this season that delve incredibly deep into what makes him tick. For the first two or three seasons, it could be argued that Riker is the closest thing TNG has to a protagonist, but he is left mostly in the background here, only serving as a foil for Ro and a back-up for Picard's leadership. I'm not saying Riker is disinteresting, but Picard is a much deeper enigma that works even better as the show's central point of view. Despite how well things come together this season, there is still more room for growth, and it will be interesting to rewatch where TNG goes next.